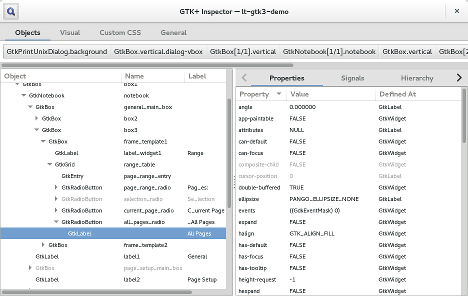 GTK developer Matthias Clasen recently blogged the new GTK Inspector tool for Fedora application developers. This inspector allows you to explore the widget hierarchy, change properties, tweak theme settings of a running GTK app. It is similar in concept to the web inspectors that most browsers now have that allow a web developer to inspect the DOM. Enhancements like the new inspector are all results of the GNOME Developer Experience initiative that has recently seen a lot of attention in the upstream GNOME project, including a recent hackfest in Berlin. The new tool should be available in rawhide soon, but in the meantime check out this awesome video of the tool in action.